Now that is interesting, for the third day in a row I am covering - which shows they are on the offensive. 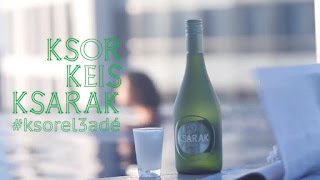 This time with a full movie (watch here) to target millenials and Arak with their Ksarak brand - the idea is simple: You do not need a veranda and a grape tree (the usual Lebanese settings for Arak) to enjoy it. Cue all the situations hipserish millenials can be found in enjoying Arak. Now of course how many millenials identify with the situations in question is a different thing altogether (trust me I interact with them at university and I know you cannot lump them under one umbrella!). Still, the end of the ad is a beautiful piece of copywriting: Ksor Keis Ksarak (ksor means "add water to" and is known to be the base of the word "elixir" hence the wine brand Ixsir! Keis means "cup" so the sentence goes "enjoy a cup of Ksarak"). The # however is #ksorel3ade with ksor in this case meaning "break" al el 3ade means "tradition". Smart. Really a fine piece of copywriting here!